Over-complicated workflows. Redundant information. Gigantic, terrifying, business processes! It can all be so scary. 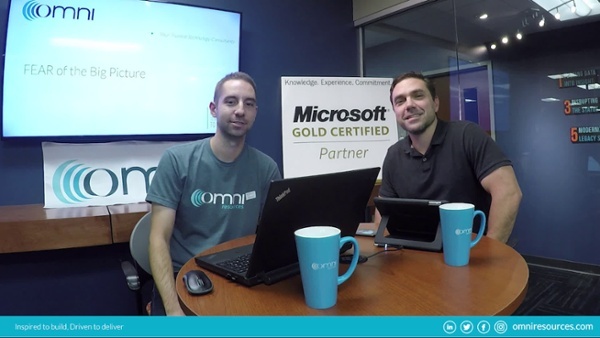 The latest episode of Omni's series, All Things BPM with Aaron and Mike: A Vlog Dedicated to Business Process Management, celebrates Halloween by getting spoooooooky with BPM. Solution Consultant Aaron Carmody and Project Manager Michael Matter spend this episode talking about some of the biggest fears organizations have when it comes to Business Process Management (BPM). So, grab some popcorn, sit back and get ready to confront your BPM fears. Have you seen our first vlog? Every company has business processes that are problematic; they can be cumbersome and slow or simply tedious manual processes that have grown organically over time. But what about that one process that's grown for so long that it has turned into a monster? It's complex, it's eaten other processes, it's grown tentacles and you can't control it anymore. No worries. Aaron and Mike can help you get that beast of a process under control using the power of business process management. First of all, you have to know what the process looks like, no matter how terrifying it is. You can't tame a monster unless you know what you're dealing with and some organizations might be worried about bringing people onboard because they can't explain their processes. That's where a process flow — one of the tools of BPM — comes in. You can map the monster by creating a process flow that shows you all the steps in the big process. It might seem like a daunting task but it's worth doing because once you map your process, you can start breaking it down into smaller pieces. Taking that big process a little bit at a time will help you drill down on problem areas, find pain points and adjust little inefficiencies will make a difference. See how BPM simplified one common business process. Ready to wield the power of business process management and slay some scary processes? Watch the vlog to get started. Need more information on business process automation (BPA) and BPM after watching the vlog? As partners with leading software companies, Omni has met the technical requirements to sell, implement and deploy business process solutions to our customers. We can help you simplify your own workflows with business process management and process automation. Need help understanding how BPM can transform your business? Contact Omni today. Want to learn more about BPM? Aaron Carmody: Aaron Carmody is passionate about making business simpler. A K2 expert, he's been helping businesses in the Midwest streamline their back office processes for years — both as an independent consultant and as a Solutions Consultant for Omni. When he isn't managing business processes, he's spending time with his wife and six children. Mike Matter: Mike Matter is Project Manager and Scrum Master at Omni. He has 13+ years of experience in the information technology industry. Prior to Omni, he worked for a large Wisconsin based retailer leading agile projects, implementing customer facing technologies and sparring with the man. He also knows Cobol and is proud of it. Mike grew up in the Fox Valley. He holds a bachelor degree in Management Information Systems and a master degree in Business Administration from the University of Wisconsin-Milwaukee. He does not love to mow the lawn or shovel snow, but his wife Katie does, and he loves her. They have two children and reside in the Appleton area.